Knitting Like Crazy: It's a Yarn Dyeing kind of weekend. It's a Yarn Dyeing kind of weekend. 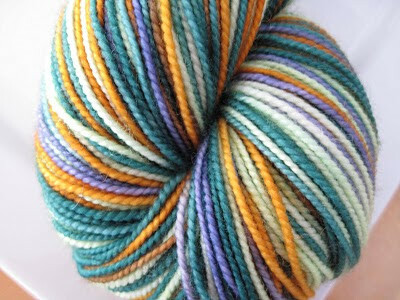 This weekend I did quite a bit of yarn dyeing. I wanted to start 2010 off right! 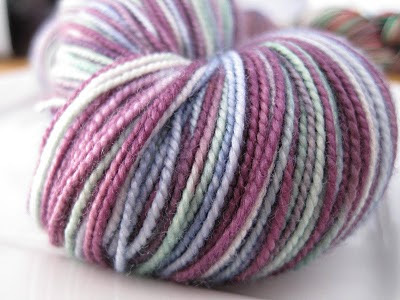 I have decided that I am really going to put a lot of effort forth this year with the Knitting Like Crazy yarn. After giving it a lot of thought, I really need to work towards doing this full time. Maybe not this year, but sometime in the near future. I've decided that there is no point in wasting my time doing something I pretty much hate. I mean, sure, it is kind of fun telling people I test sh*t water for a living, but if I could go back in time and pick it as a career would I pick it again? Um, no. I want a job that is full of things that are squooshy and colorful, not full of bacteria and all one weirdly gross color of grayish brown. 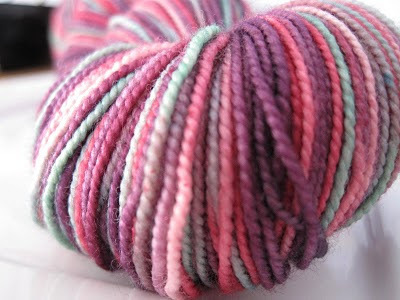 So, this weekend, I dyed yarn. I figured maybe there is something to that whole thought of starting the year off right, or starting the new year with the way you hope the year will go or whatever. Want to see more? Jump on over to my etsy site for a peak. Happy knitting! Or happy doing whatever that thing is that makes you crazy happy!